Bird feeders come in a variety of sizes, shapes and designs. 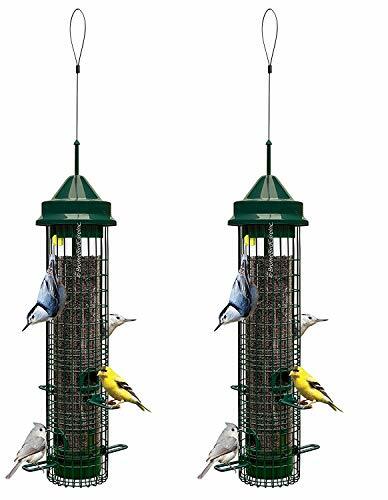 Used outdoors, these feeders attract birds while supplying seed or oils to different species. They are also used for birdwatching. There are many types of bird feeds and some of better quality than others. We have brought together all of the top models and narrowed the list down of the ones we think are the best. The Brome SquirrelBuster+ Wild Bird Feeder with Cardinal Perch Ring hangs easily almost anywhere with the use of a wall bracket, extension hook, or tree hook (sold separately) and will hold 3quarts of a wide variety of seed and seeds blends. 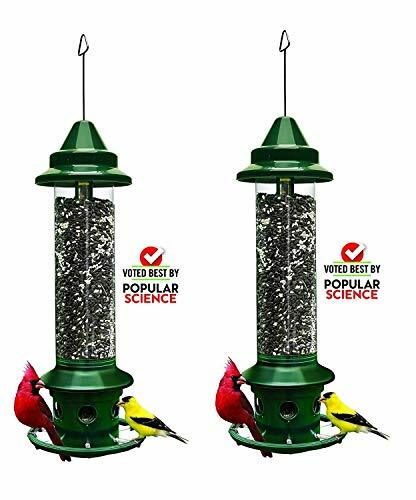 It is a must have for nature lovers and will attract Chickadees, Downy Woodpeckers, Cardinals, perching birds, Indigo Buntings, clinging birds, Purple, Gold Finches, Rose-Breasted & Evening Grosbeaks. Cardinal will be comfortable on their own perch with the included ring. The Brome 1024 Squirrel Buster Plus Wild Bird Feeder is squirrel-proof, large-bird proof and chew-proof because of it’s innovative design. It is equipped with Brome’s patented “Squirrel Buster Technology.” This keeps the squirrels away so the birds can have seed while remaining unharmed. The feeder bottom has openings which align with the ports that access the feed and if an eager squirrel leaps into the feeder, the shroud is forced down automatically due to the weight, preventing access to feed. The mechanism for closing has adjustable settings making it simple to control (increase or decrease according to weight) for many squirrels and large birds. The Brome SquirrelBuster Classic (1015) attracts a variety of clinging & perching birds and can be placed just in almost any location in your yard. It is easy to fill and clean comes with a 2 year warranty. The Brome 1015 SquirrelBuster Classic is a squirrel proof bird feeder which stores up to 1.4 quarts of bird seed. This feeder technology works by leveraging the weight of the squirrel against the seed access points. If a squirrel attempts to obtain seed from the feed, his weight closes access to the seed ports and has a specially design protective tube for more safety. When squirrels attempt to dine at the birds table, the squirrels are blocked, but they are not harmed. This feeder is very popular and is highly rated. 2 or more feeders are recommended to accommodates multiple species and many extra hours of bird watching. 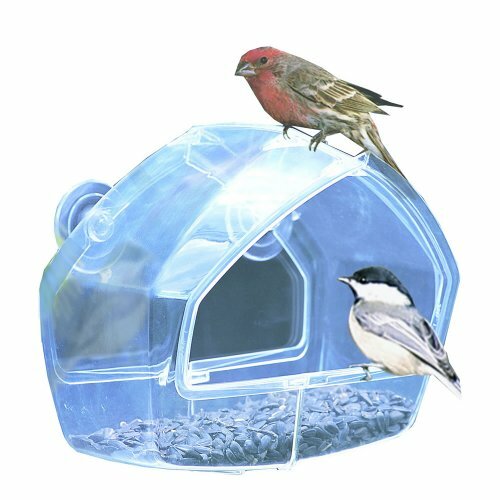 The Birdscapes Wild-Bird Window Feeder by Perky Pet has a crystal clear design that allows you to watch birds feed clearer and easier. It easily attaches most window surface and and easy to remove, clean and fill. It is compact in size and economical. There is a compartment that opens wide which allows birds to have access to every bit of the 1 cup of seeds that it holds. It has a comfortable perch and a hooded overhang for shelter. 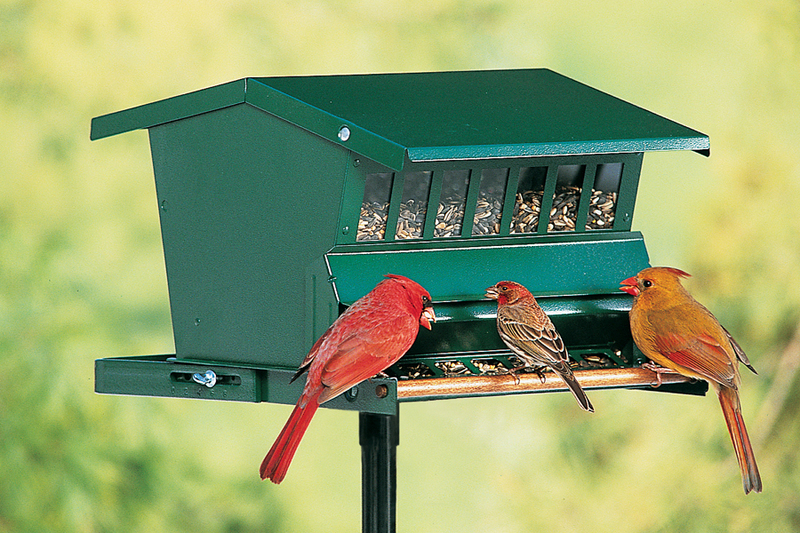 Watching birds at a feeder has never been easier and neither has cleaning and feeding. The Birdscape Wild Bird Window feeder is a convenient choice and will keep the birds and you happy throughout the seasons. A nice, natural way for you to enjoy and relax while watching wild birds feeding.